How could such a simple question fill me with anxiety and dread? It used to leave me making whatever I could find from the hodgepodge of ingredients in my pantry, scrambling to the grocery store or overspending on eating out. Something needed to change. That’s why I incorporated Meal Planning into Artful Agenda. Since planning meals ahead of time has made such a positive impact on my life, I want to share my best tips for getting started with you! Take a little time each week to sit down and plan your meals for each day. (I usually just plan dinners and eat leftovers or quick-prep things like sandwiches for lunch, but you can plan every single meal and snack ahead of time if you want to!) There are so many places to go for inspiration these days. From cookbooks to the internet, the resources are endless, including options tailored to your personal goals, budget, or level of cooking expertise. My personal favorite spot to browse is Pinterest. There are so many fun and creative recipes. As much as I love discovering and trying new meals, many of my planned meals are recipes I know by heart or ones that I can look up super quickly and execute easily. To add some variety, once a week I usually attempt cooking something new. (It’s amazing how much and how quickly you learn when you are experimenting with new recipes even just once a week!) Looking back on previous weeks’ meals serves as a good source of inspiration for me because it helps me remember what dinners we all enjoyed. *Bonus tip: Track your water! I can’t stress how much tracking my water has motivated me to actually drink water. 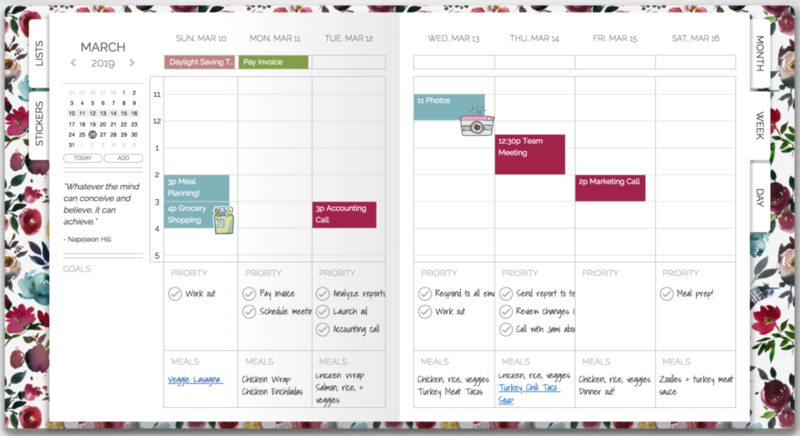 It’s one of my favorite features of Artful Agenda! Drinking enough water has so many benefits for your body both physically and mentally. If you are looking to improve your health, don’t skip your water! Filling up my water glasses alongside my daily planning has kept me motivated to drink 8 glasses a day, and I’ve noticed significant health benefits and increased energy from doing this. While it’s easy to get carried away with the infinite amount of tasty meals online, don’t forget to keep your budget in mind when you are making your plan. Finding recipes that require similar ingredients will make a big difference in how fast you go through your grocery budget. Planning completely different meals every day can leave you with an overloaded shopping cart and a costly grocery bill. Start by seeing what you already have and find recipes that utilize these common ingredients. If you find yourself continuously throwing away expired food or forgetting what you have available, it might be helpful to create a list of all the ingredients you already have! A running inventory of food you have at home can help to avoid waste and repeat buys. Lists are another place to store your favorite recipes or ones you run across that you would like to try in the future! Can you tell I love lists? Picking a day of the week and blocking off time to shop is key. I almost always plan my meals, make my list and do my shopping for the rest of the week on Sunday. 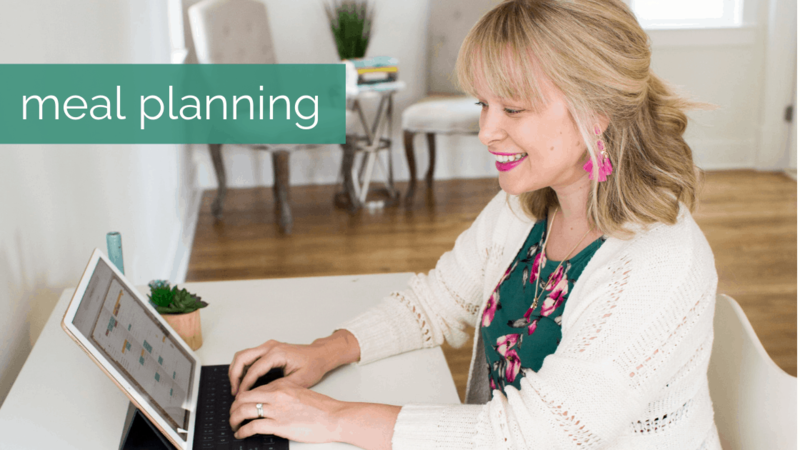 Everyone will find different ways to make this work for themselves, so don’t be afraid to experiment to find your perfect meal planning routine! One thing I can promise you is this: your life will improve if you give it a shot. 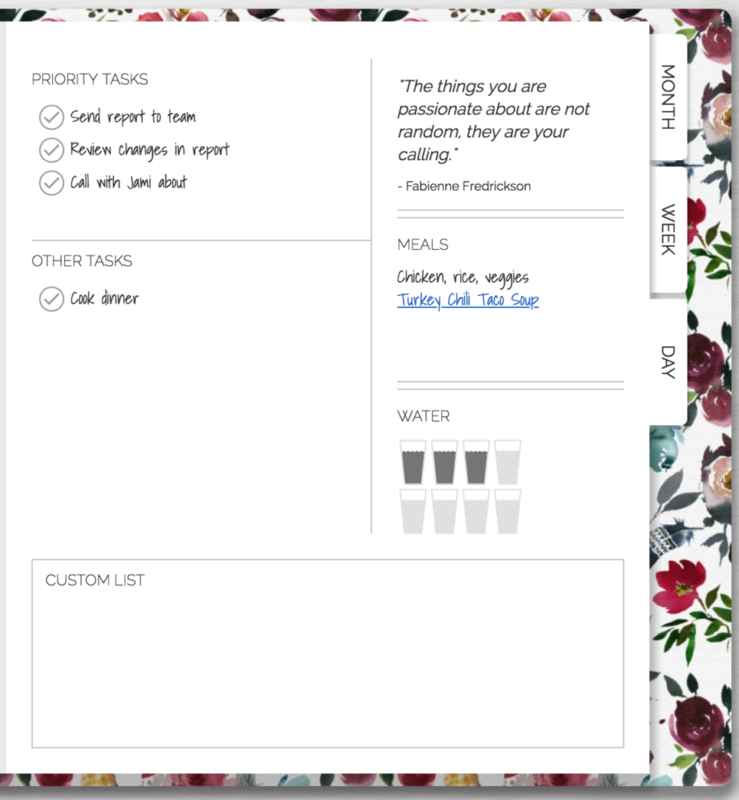 Meal planning has turned what used to be something stressful into something I look forward to, and I couldn’t do it without my Artful Agenda. I hope I have given you some inspiration to bring this into your home so you can keep on living your best life!